Our office is located approximately 20m (30 seconds) from exit No.8 of Tameike-sanno or Kokkai-gijidomae Station to our building. Enter the white building and take the elevator to the 8th floor. 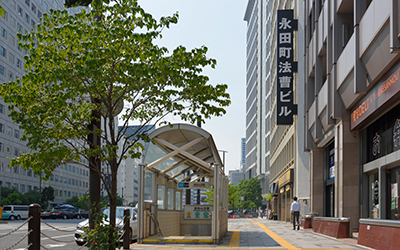 Alternatively, if you wish to take an elevator from Tameike-Sanno station instead of the escalator and stairs, please take the elevator in front of Starbucks Coffee situated right outside of the ticket gate of Tameike-Sanno Station, Akasaka Direction. After you reach the ground level taking the elevator, please walk to the right about 20 seconds to the big intersection. Then please turn left at the intersection and enter the entrance of the first building, next to “Curry House CoCo”. It should not take you more than a minute from the station elevator. There is a coin-operated parking lot behind our building. Please take the one way road from Roppongi-Dori.